I didn’t know what my life was missing a few weeks ago. I know now that it was Digital Breakouts! Holy moly! They are fun, load the little darlings up with CI and give tired teachers a break. What’s not to love!? 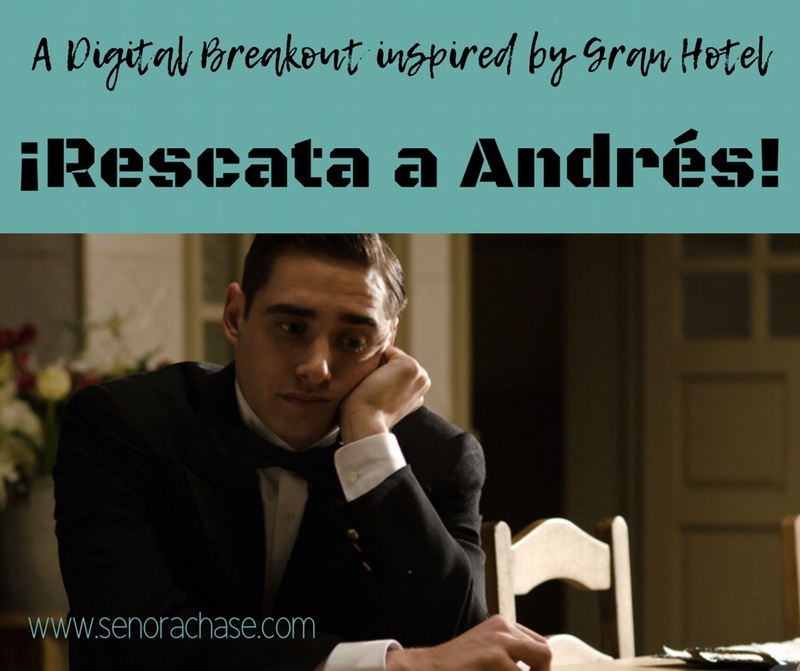 All year we’ve been watching and discussing Gran Hotel… talk about compelling input! And because of snow days we have to make up after graduation (?!) I’ll see most of my Spanish 4s (except the Seniors!) after they’ve taken their final exams, so I thought a Digital Breakout would be a fun way to end a great year together. Special thanks to Katie Strand-Carroll, Emily Bradvica, Amy Cooper and Kristine Keefe-Hassan for “test driving” this breakout and giving me feedback. If you run into any problems or have any suggestions for improving it, please let me know! They will find the secret message by clicking on Andrés’ Instagreat’s caption ¿Sueño o pesadilla? Students will watch an EdPuzzle video about the Palacio and answer Yes-No questions by selecting the Thumbs up or Thumbs down icon. The very last EdPuzzle question is a link that will tell them that the Thumbs Up icon is plus 50 points and the Thumbs Down icon is minus 13 points. Students will watch it again and add 50 or subtract 13 for each question, then type the solution into Clave #3. For this one they’ll find the ransom note hidden in the slide with the bedroom picture (it’s hidden between the bed and the right nightstand). They might think it’s a hidden message or code, but really they just have to read it and they’ll realize it’s written by the person who captured Pobre Andrés. There is no name on the letter but if they go back to Andrés’ FakeBook, they’ll see a cryptic message from a fan named Isadora, who posted “un día, serás mío”. If they get stuck on this clue, direct them to the line in the letter that says, “Aunque solo soy una de sus 2.3 millones de amigos ahora”…as soon as I pointed that out, they figured out they needed to look at his FakeBook. That’s it, folks! Once they enter in the secret codes, they’ll free Andrés and we can all live happily ever after! I know you said that you bought the DVD series (before it was on Netflix), I can only seem to find a European format online. Where did you purchase yours from?